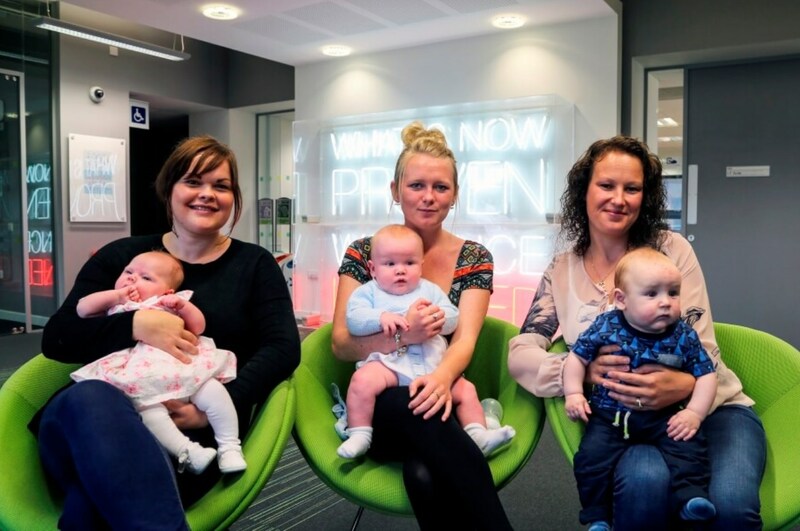 Three students who all fell pregnant and gave birth while in the middle of their Public Health degree have navigated the trials of raising a new baby to complete their course and graduate with honours together at the Stadium of Light. Marie Hinds, Claire Fulcher and Stacey Walters all had their own personal reasons to make the life-changing decision to return to higher education fuelled by a passion to make a positive difference to other people’s lives through healthcare. Their first year was challenging but all three women were embracing the course work, however, by the second year the adult learners had coincidently all fallen pregnant within weeks of each other. But rather than take a break from their degrees, the students carried on their studies, receiving support from their tutors as well as each other. They all took a leave of absence to have their babies, then returned to complete the programme with impressive results and graduate at the University’s annual award ceremonies this week (July) alongside thousands of other students, receiving their awards from Chancellor Steve Cram. Former nursery nurse Marie Hinds, 38, from Newcastle, applied to study at university as she wanted to do “something for herself” after being a stay-at -home mum to her seven children for 10 years. She said: “I found out I was pregnant with my son Grayson just before starting my second year and knowing that those grades counted towards my final marks, I wanted to stay at university for as long as possible and made sure I delivered my final presentation just seven days before giving birth! “I was tired, but determined to meet all the deadlines and perform as well as I possibly could. Having two other classmates pregnant at the same time - Stacey due just a week before myself - was a great support with the three of us reassuring each other and becoming very close friends. I don't think I'd have coped as well as I did if it wasn't for Stacey and Claire going through it with me. We are quite a close knit class anyway so found that other students would also look out for us too, always asking if we needed anything. “The main challenges really was managing the balance between hitting deadlines and looking after my health as I found it exhausting at times, especially travelling back and forth to university in my later stages of pregnancy." Marie will now take what she has learned both personally and academically to begin a Midwifery Postgraduate Diploma at Northumbria University starting in September 2017. Claire Fulcher, 28, from Bedlington, Northumberland, decided to swap her day job in a call centre for a career in healthcare. She said: “I always knew that I wanted to study further, but it took me a few years to pluck up the courage and figure out what sort of course to apply for. “I chose public health as I found it interesting and really enjoyed the experience. University has been so supportive, especially when I became pregnant with Scarlett, my first baby. I needed to change my module choices and this was no problem. As a first time mum, it definitely helped that two of my fellow students were going through the same thing at the same time, we were able to discuss problems both pregnancy and uni related. Claire is currently applying for a Masters in Psychology with a view to working in the area of Health Psychology in the future. Stacey Walters, 23, from Sunderland, loved her course and says she has learned so much from her experience. Stacey now plans to complete a Masters in Public Health and work in the area of community health, helping people with drug and alcohol problems. Karen Carling, Senior Lecturer – Programme Leader BSc (Hons) Public Health, said: “I can remember my first day with these students who were anxious, nervous and somewhat overwhelmed by what lay ahead of them – but the one thing they all possessed was a passion for health and the enthusiasm to make a positive difference in the health arena.